Weather affects all facets of life. It influences our daily activities, what we wear, how we feel, and sometimes even where we choose to live our lives. It is true that without the elements produced by Mother Nature herself, life on Earth would be non-existent. Obviously plant life, especially row crop agriculture, is highly dependent on what the weather will deliver each growing season. Traders, producers, and end-users rely on a variety of weather resources year around. These sources help them determine the future price of corn, wheat, and soybeans.In this segment of “Inside the Grain and Oilseed Markets”we will explore these different resources and find out exactly how these individuals use this information to their benefit. Also, we will pick apart how certain weather events at certain times can affect the crops and their prices. Although sometimes questioned on their accuracy, meteorologists are the main resource in knowing what the weather is doing or may do in the future. If it was not for these individuals and their analysis, weather could hardly be a factor in determining the future prices of each crop. Throughout growing season, traders and producers will hone in on daily weather forecasts. There are morning, midday, and afternoon weather updates that are released by various weather groups which focus specifically on how the weather will affect crops (this information is provided directly to Daniels Trading clients). Many local and national meteorologists report crop weather. It is wise to choose 3 to 5 different resources and compare notes. Many times their forecasts will differ in specifics, but together their forecasts will paint a broad picture that is similar in nature. If you focus on one resource, it does not mean that the rest of the market is doing the same thing. Remember to be diverse and produce your own conclusion after comparing notes. This will be very helpful in trying to put together a hedge strategy or trade. Keep tabs on weather year round, as “off-season” weather will have an effect on the next year’s conditions, i.e. sub-soil moisture. When and where weather events take place has the most direct influence on what the condition of the crop will be at harvest time. Weather extremes (too hot/too cold or too wet/too dry) at certain times of the year will affect the crop condition and thus the price. How much of an effect the weather has on prices always depends on supply. A tight supply will make the market more sensitive to weather just as an ample supply will make the market less sensitive to weather. To simplify this, we will explore what may happen during growing season and how these different factors will affect crops and their prices. For the purpose of these examples, consider normal stocks and normal demand. We are only focusing on how domestic weather alone can move the market while ignoring other fundamentals. Since corn and soybeans have a different planting and harvest time than Chicago wheat, we will look at two different examples. It is spring and farmers across the Corn Belt are ready to begin planting. The weather has been wet and has them pacing back and forth waiting for conditions to improve. Over the next three months, farmers are able to get their crop in the ground; however, this timing makes farmers a bit uncomfortable. Meanwhile, grain traders are becoming bullish. From what they know right now, a late planted crop means that a younger plant is more likely to stress mid-summer than a more mature plant which was planted earlier. If the summer is hotter than average, this could mean trouble. This also means that harvest comes later and that frost is more of a threat to the crop later down the road. Traders begin to buy corn and soybeans due to these concerns. It is now summer and the weather is hot and rain is limited. As if farmers were not already worried about planting late, now the extreme weather conditions are stressing their crops. Traders start to notice that the price pattern is becoming more bullish. The hot weather in the middle of growing season tells the farmers that crop pollination is being affected in a negative way and that a stressed crop could have difficultly producing top yields. This supports the market, and traders extend their bullish position on fears that harvest will show poor yields and low new crop stocks. It is now early fall in the Midwest. So far, farmers do not like what they see. All season long they have watched their crops suffer due to extreme conditions. Although conditions have been extreme, there is still a crop in the field to be harvested but yields could be sub-par. The summer has been hot and dry, but the weather starts to change rapidly. There is now a threat of frost in the Midwest which could destroy a majority of the later planted crops. Traders have been buying corn and soybeans all growing season with expectations being confirmed by USDA crop reports. With news of frost, traders again add to their long positions. In their minds with the late-planted crop, extreme mid-summer conditions, and a less mature crop being exposed to frost, production could be poor at the end of harvest. The traders’expectations were confirmed, and ending stocks for corn and soybeans were both at all-time lows, sending the price even higher after growing season. For an example of good growing conditions that would push prices lower, basically reverse the conditions in the example above. It is fall, and farmers are ready to start planting wheat. Dry conditions are plaguing the region and there is little moisture in the soil to get the wheat off to a good start. Farmers plant their crop and pray for rain. Traders are talking with wheat producers that they know and are reading commentary about wheat. They are coming to a conclusion that things are a bit dry and wheat may have trouble getting off to a good start. They now begin buying wheat. The wheat crop finally gets out of the ground but it is small going into winter. All winter long the crop remains dormant until spring. Spring finally arrives and wheat comes out of dormancy. Over the winter, wheat growing areas were abnormally dry, causing limited sub-soil moisture for wheat. Rains also remain sparse throughout spring into the beginning of summer. Traders have been paying attention to the weather and USDA reports all winter long, and due to the dry conditions have been buying the wheat market. The traders’expectations were confirmed as wheat yields hit all-time lows. The dry weather all throughout growing season produced a poor crop and prices moved steadily higher due to this factor. For an example of good growing conditions that would push prices lower, replace the above factors with adequate moisture at planting time, moderate spring time rains, and dry weather during harvest. Weather in other countries affects the way their crops grow just like it does in the U.S. Two things that are important to know are when these crops are grown and how weather conditions, good or bad, can affect the price of these commodities here at home. *Note: The growing seasons in both Argentina and Brazil have slightly different stages depending on the region. The dates below reflect the earliest planted region with the latest harvested region. If weather is cooperative during growing season, one would think that world stocks may increase, thus putting pressure on prices at home. If the weather did not cooperate, one would think that South America could possibly limit exports or raise prices, thus making the U.S. a more attractive market. If this occurred, prices at home would likely find support. 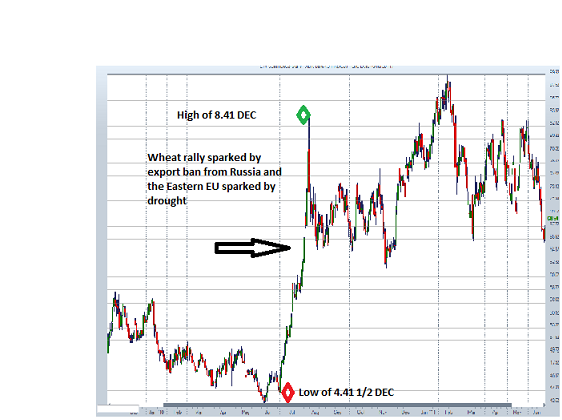 A perfect example of how weather can affect a crop and, accordingly, ending stocks is the Russian wheat ban in 2010. Russia and Eastern Europe was hit with a severe drought that caused an export ban and stock piling of wheat. This made other wheat markets, such as the U.S., attractive due to the potential of receiving new export business. The chart below shows how the market spiked during this event overseas. Overall, there are many factors concerning crop production that can be affected by weather. Some are bigger than others, but all are important in their own fashion. Having a good understanding of how the weather affects crop production could prove to be a good tool in your trading arsenal. For a deeper look into weather and its affects across the world, follow this link. To keep a close watch on crop progress and soil moisture state by state, check out this information by the USDA.